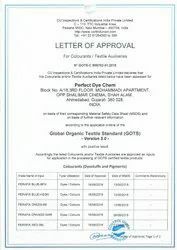 We, “Perfect Dye Chem” are amongst the foremost manufacturer, exporter and supplier of Industrial Dyes, Emulsions and Auxiliaries. The non toxic and Eco friendly chemicals offered by us are popular among our customers for their purity, superior color fastness, alkali stability and water solubility. Owing to these significant features, these find applications in numerous segments like Textile and Leather industries. The wide array of Textile and Leather dyes manufactured using quality chemicals are procured from candid vendors. Further, we are supported by adroit professionals who work in close association to manufacture Textile and Leather dyes as per the exact requirements of the clients. 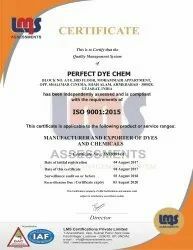 We are also backed by advanced manufacturing, quality testing, R&D and warehouse facilities that enable us to offer comprehensive and flawless range of Dyes. In addition to these, we have wide distribution network that ensures smooth, hassle free and on time delivery of quality approved Textile and Leather dyes. Under the proficient guidance of our mentor, Mr. Iqbal Ghonia, we have been able to set us apart from our competitors. Our mentor has immense knowledge and rich experience in this domain. His unparalleled supervision has helped us to understand the specific demands of our valued clientèle and meet them with utmost perfection. We are offering our clients an impeccable range of Textile and Leather dyes. These are manufactured using quality chemicals in our state-of-the-art manufacturing unit. Owing to their exceptional features, these are meeting the requirements of various segments like Textile and Leather Industry. The exclusive range of Textile and leather dyes manufactured by us find applications in varied segments owing to their purity, uniform coloring, non toxicity and high fastness properties. We are supported by experienced personnel who work hard towards bringing improvisations in our existing range of Industrial Dyes and Organic Pigments. Owing to their dedicated endeavors we are successfully meeting the unending and diverse demands of our customers. Apart from this, our team members are backed by relevant industry experience and they are capable of developing the Textile and leather dyes as per specifications detailed by clients.